The Nile basin, like many parts of the world, has many areas where rainfall data is either sparse or unevenly distributed and in some cases nonexistent. In many cases, weather observation networks are deteriorating leaving a challenge to planners requiring the use of such data. In such an area, satellite based observations present themselves as an option since they provide essential, and at times the only spatiotemporal data for use. In this atlas, rainfall estimates are based on observed data collected from countries and on Tropical Rainfall Measuring Mission (TRMM). TRMM is a research satellite that was designed to improve our understanding of the distribution and variability of precipitation within the tropics. Overall, TRMM: 3B43 v7data indicates that there is wide rainfall variability in the basin which is also confirmed by the ground measurements. The mean annual rainfall, presented here, compares well with the recorded observations within the Nile basin, with the minimum seen to be less than 50mm in the arid areas of the northern part of Sudan and Egypt and the maximum being registered in the equatorial lakes region in areas around lake Victoria and the Ethiopian highlands, like it is with the recorded observations. Generally, it can be seen that the equatorial lakes region and the Ethiopian highlands generally receives annual rainfall of over 1,000mm and the other parts of the basin receive less than 700mm. The high altitude area (Rwenzori mountains in western Uganda, Mount Elgon, and the Ethiopian highlands) register rainfall in excess of 1,500mm and these are considered to be the water towers of the basin. Rainfall is a major hydrological feature of the Nile basin and exhibits spatial and temporal variation at both the basin and country level. The Inter-Tropical Convergence Zone (ITCZ), which fluctuates seasonally, drives the region’s rainfall regime and influences the hydrology of the Nile (Camberlin 2009, Sutcliffe and Parks 1999). Precipitation generally increases from north to south and with elevation (Beyene and others 2007). The total amount of precipitation over the Nile basin countries is 7 000 BCM/yr, of which 1660 BCM/yr falls in the Nile basin. The mean for the entire Nile basin is 615 mm/yr (Ribbe and Ahmed 2006). About 28% of the basin receives less than 100 mm of rain annually, part of it experiences hyper- arid conditions and another substantial area (about 34%) has sub-humid conditions and receives between 700 and 1300 mm of rain. Only the southwestern part of South Sudan, the Lake Victoria basin region and the Ethiopian highlands receive over 1000 mm of rainfall a year (Camberlin 2009). Rainfall within the basin is modified by the presence of the different water bodies and therefore varies in different sub‑basins. For example, in the Blue Nile basin of Ethiopia, the mean annual rainfall ranges from 1 000 mm in the northeast to 2000 mm in the southeast (Ribbe and Ahmed 2006). In the Equatorial lakes region, it varies between 950 mm and 2450 mm. 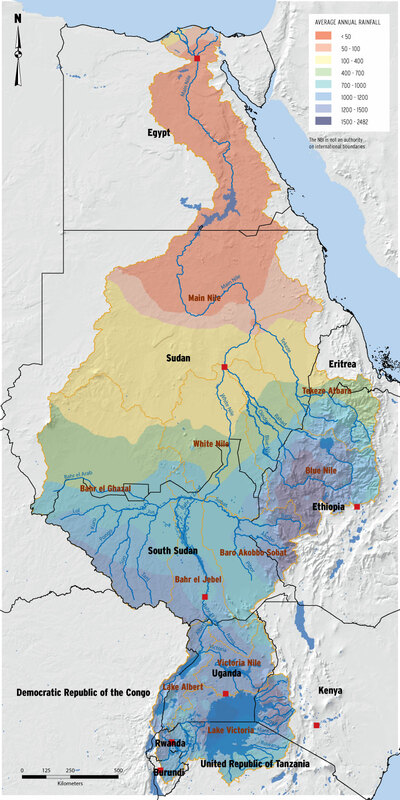 South of the Blue Nile River Basin, precipitation reaches over 2400 mm in the Baro River basin, recharging the Baro River, which joins the White Nile before Khartoum (Conway 2000).